After reversing the chainring and sprocket and fitting a new chain I have noticed that the crank isn't turning at all smoothly in the EBB. Can the EBB be serviced/lubricated or is this going to be due to wear or damage? Brian, do you mean the eccentric is difficult to move/adjust for chain tension? If so, the eccentric needs to be lubed so it can more easily turn in the frame's bottom bracket hanger. Grease or anti-seize will prevent future galling between the aluminum eccentric and steel bottom bracket hanger. If the eccentric has been adjusted a number of times so fresh indents have been made too close together, it can make it difficult to rotate the eccentric for adjustment and once rotated, may not easily hold adjustment. Solution here would be to replace the eccentric in this case. The damage would be visible in the form of a number of closely spaced divots in the edge faces of the eccentric. If instead you find the cranks are not spinning freely or smoothly on the bottom bracket bearings (in the eccentric), then you would need to replace or service the bottom bracket depending on if it is a cartridge bb or one that can be opened and serviced. Hi Dan. It's adjustable OK. The cranks are not spinning freely in the BB. Can I tell which type of BB I have without dismantling it? Poor you, sounds like a whole raft of trouble you've had to deal with! So all you have done is take the cranks off the square taper bottom bracket using a crank tool? If it worked OK before, it is hard to imagine how removing might have damaged anything. I assume the cranks are properly seated on the tapers. If standard and original our BB is probably a Shimano UN55 or UN72. The problem is that they come various flavours to do with axle length, diameter and how much sticks out left and right. I don't think there is anything visible at the ends so it would have to come out, but maybe a call to SJS is in order? 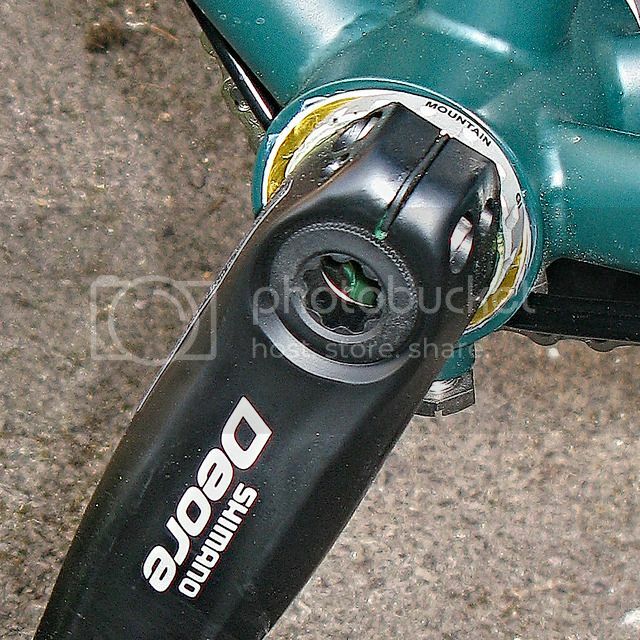 Did you get that seized seatpost shifted? I picked up that woe on another forum. The CTC folk have been discussing stuck posts and the name of a specialist remover The Seatpost man came up in Chorley Lancashire. Two further thoughts: I assume this is with the chain off? If the chain was too tight it could cause this problem. Also a long shot, but undo the eccentric bolts with the chain off and see if it persists -there's an outside chance the BB might be under pressure. From my Thorn Sterling invoice: Shimano Deore FC-M532 26/36/48 2 piece design 9 speed 4 Arm Triple Chainset Black 170mm. It's a Hollowtech II system. Yes, it's with the chain off. I had the same thought. You mean the two bolts beneath the bottom bracket? I'll have a look at that. Ah ok, that explains why the chain ring you mention is apparently repurposed from a derailleur system. I’m only familiar with old fashioned square taper systems. I’m sure someone will advise on hollotech external bottom brackets. These should be easier to replace. No luck yet. A friend and I had a go but failed. I have ordered some Plusgas as some say it's a better product than WD40 and I am riding on the gravel roads with no seatpost clamp and live in hope! Yes, I saw that about the Seatpost Man. Interesting but a long way from southern Spain. If I drive to UK I might take the bike with me an pop up there. Am I correct in assuming that the bottom bracket cups should be tight into the BB insert? The left one on my system can be rotated left and right with the fingers. If you have an external bottom bracket, then yes! definitely the cups should be tight in the eccentric. They should be for an inboard/square taper cartridge bb also. If the bottom bracket is a Shimano one with external/outboard bearings and feels rough or excessively tight while turning, it has likely had it, but I'd sure try tightening the cups first. External units are sensitive to needing square faces and if one cup is loose, it won't turn smoothly. In my experience, Shimano's external bottom brackets are not been so very long-lasting for me in my heavy, high-mileage use. For this reason, I switched to a Phil Wood unit on my Nomad and have had no problems since. Thanks Dan. I am not at all technical so I attach a pic of the area of my bike when new. Perhaps from it you can tell me what type of bracket it is. It's definitely a Shimano system. Brian, that is definitely a Shimano external/outboard bearing bottom bracket. The preload adjustment is that little star-shaped thing in the center of the left crankarm. If the cups are loose they can become misaligned, leading to excess friction. Excess preload when first installing or adjusting the bottom bracket can also result in stiff turning. Your bike sure is a pretty color! Thanks again. Good to know what I am dealing with. So the bearings are housed in the cups and the cups screw into the BB insert. The crank spindle is supported by the insert. It's the insert that is eccentric and is what is turned to adjust the chain tension. I think I've got it. Correct me please if I am wrong. I guess my next job is to remove the whole thing, clean and lube, refit and tighten up properly to see if the stiffness has been fixed. If not then a new insert and new cups?